As the NBA moves towards the three-point arc, the young big men of the NBA have adapted small ball skills to keep up with the latest evolution of the association. There was a time when Shaq appeared to be the epitome of the big man, an idea which now seems quaint. His dominance during the 90’s and early 2000’s was unquestionable, but his complete lack of shooting simply doesn’t fit well in the current era, clogging the lane and slowing ball movement. Over the past few years, Anthony Davis has become the best big man by adopting a full range of skills, including outside shooting, passing and handles, earning The Brow frequent mentions as an MVP. During 2017, the staff at Canada Sports Betting believe that the following four young NBA stars will change the competitive landscape of the association, competing with Davis for top status. Embiid, Giannis, Porzingis and Towns possess game-breaking skills and talent that extremely tall men normally struggle to develop, altering the traditional role of centers and power forwards in the NBA. Patrick Ewing is one of the latest NBA alumni to express adulation for Joel Embiid, suggesting that the Cameroonian might be the most talented young center in the NBA. Embiid’s also established himself as a unique NBA personality through his sharp sense of humor and social media proficiency, tweeting fire while he rehabbed unfortunate injuries. Some may consider his media engagement to be distracting, but becoming the personification of “The Process” was a shrewd decision. The nickname shows love to long-suffering fans, respects his old GM and grows Embiid’s personal brand. More important, accepting “The Process” as a nom de guerre communicates a clear understanding of the work required to fulfill the promise of a talented, young 76ers franchise. During his brief stint in the association, Embiid has brought joy to Philadelphia on the court, starting with a turn-around jumper from the top of the key as his first NBA bucket. A short while later, playing against LeBron James for the first time, Embiid blocked King James three times, including a chase down block where he tracked LeBron from the top of the three-point arc before spiking the lay-up attempt off the glass. Settle on that for a moment: a seven-footer playing in the fourth NBA game of his career, with the dexterity and smarts to defend LeBron from the arc to the paint. Embiid’s numbers have been great on the offensive end, earning 18.2 PPG on .458/.442/.778 shooting splits over his first fifteen games. At the game time, he’s averaging 7.6 rebounds and 2.5 blocks. Incredibly, he’s accomplished these numbers with an average playing time of 23:33 per game. If his health holds up, he has a shot at becoming an unguardable center with the athleticism and savvy to shut down opposing point guards in the half-court and on transition. Right now, most Philly fans agree that The Process is worth the wait. Already the greatest player to hail from Greece, Giannis Antetokounmpo has worked hard to evolve his game since entering the association in 2013. Fans started to realize his nebulous potential when he showed off a Eurostep that starts at the three-point line and finishes with a dunk. This combination of length, speed and finesse has proven to be difficult to stop, especially as Giannis improves his shot, handles and ball distribution capabilities. Regardless of your opinion of Jason Kidd’s leadership style, the Bucks are lucky to have one of the best floor generals in NBA history teaching Giannis how to play point. So far, the experiment has produced fascinating results. Just past the quarter point of the 2016-17 NBA regular season, this 6’11” forward/ guard combo has produced 21.9 PPG, 5.9 APG and 9.0 RPG on .521/.250/.770 splits, averaging 2.1 blocks and two steals per game. Antetokounmpo has led the Bucks to a 17-point win over the Cavaliers, a one-point loss to the Spurs and a three-point loss against the Warriors during this time. As the stats suggest, the only real weakness for Giannis Antetokounmpo is three-point shooting, which he needs to improve to at least league average to maximize his suite of offensive talents. During his brief time in the NBA, he’s shown the ability to absorb NBA-level skills, so developing a three-point shot shouldn’t pose a significant challenge. Even without this aspect, Giannis will prove to be a unique big man in the NBA, forcing matchup nightmares for the opposition on a nightly basis. Kevin Garnett has been tutoring Giannis on the side recently, which will only expand Antetokounmpo’s game to new levels. New York Knicks fans were crying when Phil Jackson selected Kristaps in 2015, with one fan famously yelling “who the #&!%* is Tingus Pingus?” over social media. Didn’t take long for popular opinion to switch to the deification of Kristaps, changing his nickname from ‘Tingus Pingus’ to ‘Porzingod’ – the title of a 2016 comedy about Kristaps that starred John Leguizamo and appeared in the Tribeca Film Festival. His first season in the association revealed a mix of long-range shooting and fearlessness at the rim, resulting in several thunderous putback jams among splashes of threes. A quick glance at his first two seasons reveals superb progression, with shooting splits raised from .421/.333/.838 to .456/.381/.782 over the first 24 games of the 2016-17 season. During this campaign, his average court time has risen from 28:25 to 34:10, combining better efficiency with increased field goal attempts to lift his scoring from 14.3 PPG to 20.0 PPG. A recent win over the Pistons showed Porzingis at his peak, hitting 13-22 from the field, 3-7 from three and 6-7 from the line en route to an efficient 35-point night. He also grabbed seven boards, notched three assists and earned a steal and a block, contributing in every way possible. And all signs point to him continuing to improve over the next few years. Similar to Embiid and Antetokounmpo, Kristaps Porzingis shows a willingness to learn and a tough mental mindset, helping him focus on his game instead of the perpetual media circus of Knicks basketball. The fact that he’s a mobile, 7’3”, stretch five with a smooth three-point stroke will makes him impossible to guard. If he learns how to fully leverage his frame on the other end of the court, he’s quickly supplant Melo as the face of a Knicks franchise desperate for a championship. Kristaps drained a one-legged jumper over Dirk Nowitzki during their first meeting of the 2016-17 season, staring Disco Dirk down while returning to defense. This wasn’t a passing of the torch: instead, it was Porzingod ripping it from the hands of the German legend. 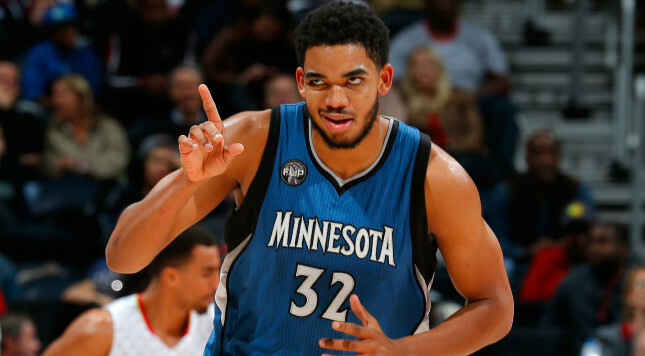 KAT was NBA-ready when he entered the league, easily winning a unanimous vote for rookie of the year. More stunning were his numbers and his efficiency, which show that he’s already an elite NBA center. This year, he’s earning 21.6 PPG on .479/.363/.774 shooting numbers, averaging 10.8 rebounds, 2.3 assists, 0.7 steals and 1.4 blocks per game. During a recent loss to the Knicks, he drained 47 points on 22 shots while pulling 18 boards, and felt that he didn’t contribute enough to the cause. Like all the great, young NBA big men on this list, he’s only going to get better. If anything, given his immediate rise in the NBA, he’ll soon be in the running for MVP on a perennial basis. Karl-Anthony Towns already possesses near-elite skill in most aspects of the game, and barring injury, he’ll soon contribute at elite levels in every aspect of the sport. Kristaps might be the better scorer, Embiid might have a higher ceiling and Giannis may be the most unique, but KAT should be considered the odds-on favorite to dethrone Anthony Davis as the best big man in the league. Towns represents the entire package, including a mind that already processes the NBA game at a high level. www.thecomeback.com/crossoverchronicles is a National Basketball Association fan web site and is in no way affiliated with the National Basketball Association, or its Properties. This site is for informational and entertainment purposes only. www.thecomeback.com/crossoverchronicles is not an official web site for the National Basketball Association. Copyright © 2016 www.thecomeback.com/crossoverchronicles - All Rights Reserved - Trademarks used herein are property of their respective owners. thecomeback.com/CrossoverChronicles is part of the NESN digital network.